Twilight Alignment is very much an interesting alignment to me. They have an interesting playstyle which includes a variety of characteristics of various Shadow Alignments. They have a likeness to the Undead in that they are death oriented having things trigger along with dying or having things happen based on their graveyards. Similarities exist to the Ravager in that they both are combo oriented and generally remove 1 combo piece in order to execute the combo. 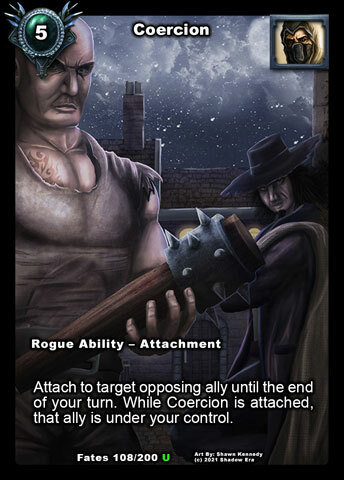 Like the Shadow Homunculus they have various growth options and can play Tower Ally builds. Finally they are very much dependent on other Twilight allies giving them a pack mentality similar to the Wulven/Yari Alignments. This guide is an evolving article which will change periodically, depending on balancing card changes or a change in my thought process after playing more with the cards. Special thanks, as always, to Gondorian, Starval, Veles, Preybird and Bob Ross for input! 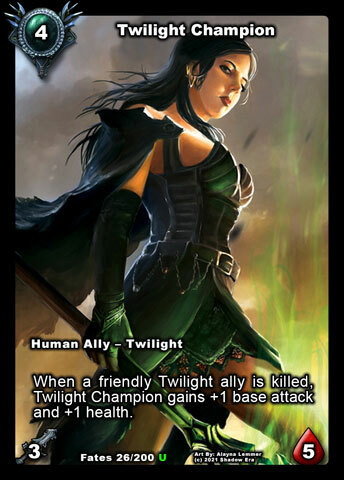 Twilight are one of the most complicated alignments to play with because of the various ways to self kill (vary between instant or delayed until the end of the turn) and cheat death. The most important thing to remember is what type of death it is (instant/delay) and Standard Resolution Order. If a card that enforces a death at the end of turn is no longer in play it can no longer enforce the death (ex. Twilight Shepherdess removed from board prior to end of turn). Scheduled Dying at the End of a Turn is not considered a Negative Effect. 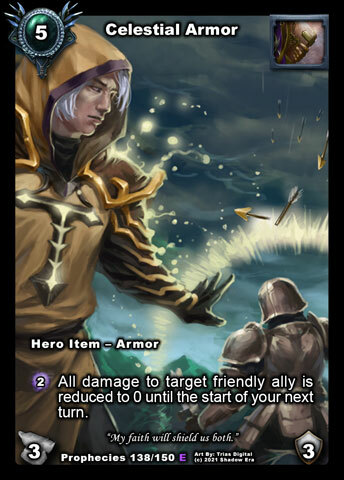 Death Prevention Effects : Holy Shield/Celestial Armor will allow ally to survive until next turn (health never equals Zero from kill effects, then when you pass end of turn the effect is no longer enforced). Decoy Trap is tricky. If you use an ability (scheduled to die at end of turn) and trigger Decoy Trap BEFORE end of turn, then ally will still die at the end of turn (ability does not check down until end of turn). If Decoy Trap is still in play at the end of turn it will trigger and ally will survive. Alignment has no ability damage outlets, so trades this for potential big damage from haste/readied, growth and/or control from Ritualist. If 2 cards that enforce a death at the end of turn are targeting each other, if both are in play at the end of turn, both will die at the end of turn. SRO will dicatate who dies first, but that ally will still have an opportunity to respond to its death and trigger its marked for death ally. (ex. 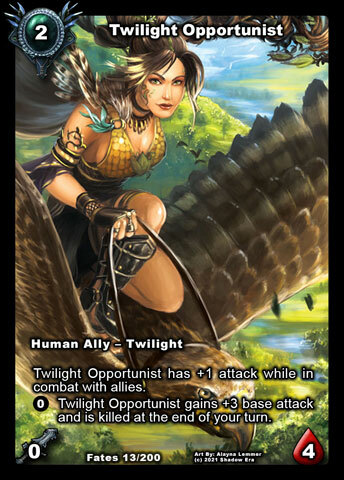 Twilight Shepherdess an Kallista targeting each other and both in play at the end of turn, both die at end of turn). Notes: Herald is the corner stone of the early game of Twilight Rush. Being able to not only deal damage but also able to buff your friendly allies creates great flexibility. Herald is also able to buff himself essentially making him a great piece to add to haste decks for cost to damage ratio. He is also a cheap combo outlet to cards like Road Less Travelled and Twilight Headdress. Notes: Opportunist is one of the strongest 2cc allies in the game, however he can also be the weakest. The base stats of 0/4 are good for survivability, but is hardly threatening at all. Essentially if you don’t use his ability then he will do nothing for you. Once you decide to use his ability he becomes a 3/4 for the cost of 2cc. 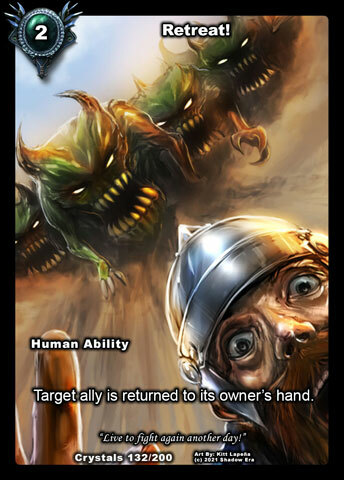 Ultimately he will die at the end of the turn, so he generally pairs favorably with cards the will give a second life (Eidolon, Earthen Protector), death prevention (Holy Shield, Decoy Trap) or bounce him to hand (Retreat, Road Less Travelled). Each has their own benefit, but death prevention has some interesting tricks. By using the ability of Twilight Opportunist the attack is a permanent gain. 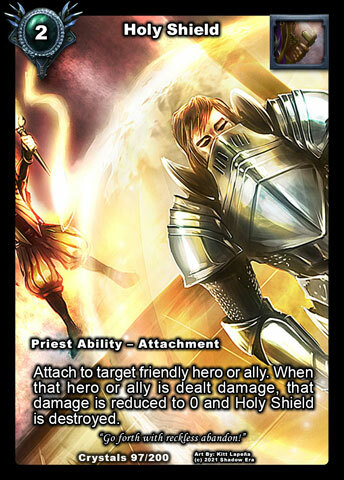 When you add a death prevention such as Holy Shield, Opportunist will survive until next turn and remain a 3/4 with option to use and stack ability again (next turn). 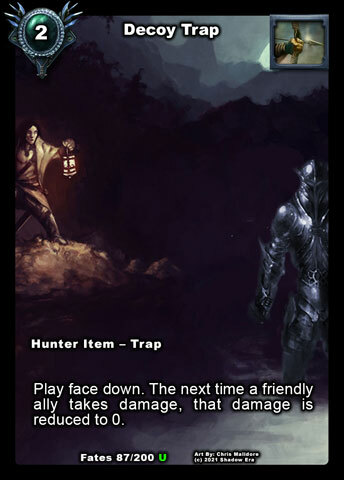 Now keep in mind that Decoy Trap is very tricky…if you use Opportunist ability and trigger Decoy Trap BEFORE end of turn, then Opportunist will still die at the end of turn. If Decoy Trap is in play at end of turn it will trigger and Opportunist will survive as 3/4. Notes: Lifebringer acts almost like a protector in a way to your other Twilight Allies. Generally she raises their health to just beyond kill range, forcing opponent to target her instead and hope to get the other target next. She is made a bit stronger by being on the board with Twilight Eidolon (forcing double kills) and Twilight Champion as he will grow upon her death. 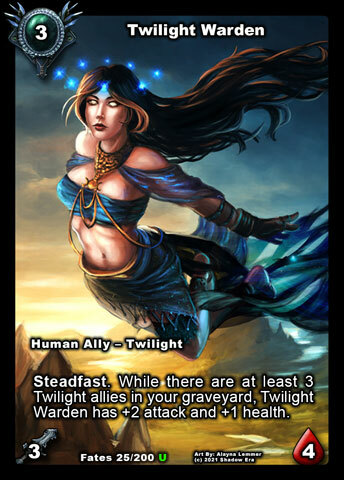 She is an essential piece for Twilight decks looking to use the telegraphed activation abilities to help increase their survivability. Lifebringer is not unique so her ability can be stacked with other Lifebringers. She is not a splashable ally. 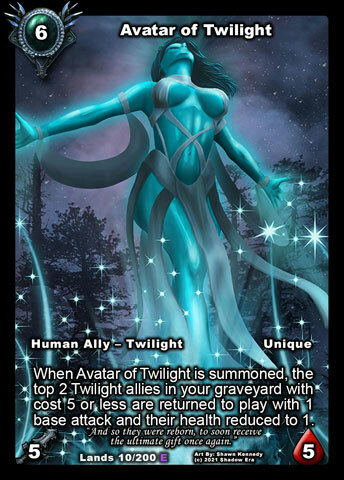 She has some additional synergy with Avatar of Twilight. Notes: Demetreyo is the human fireball of the Alignment. Pretty much restricted to Twilight builds as he will not have haste (without another friendly Twilight in play) and he dies at the end of turn otherwise. He benefits the tribe as he can be big damage especially comboed with cheap attachments such as Strength of Conviction. Additionally he makes a great growth piece too for Twilight Champion and even Twilight Headdress. 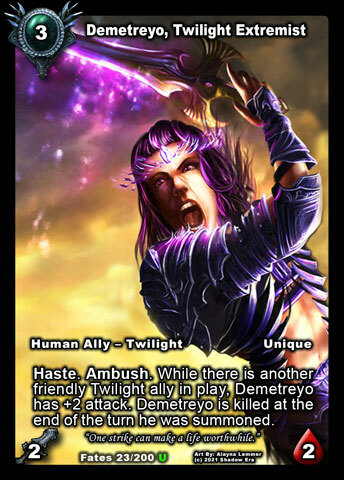 Note: Using Headdress to kill your “required” Twilight companion will result in loss of haste for Demetreyo. Life Bringer is a good drop in ally so that Demetreyo’s health can be higher (4hp) in case he receives retaliation damage and you want him to survive for some other death related combo such as Headdress. 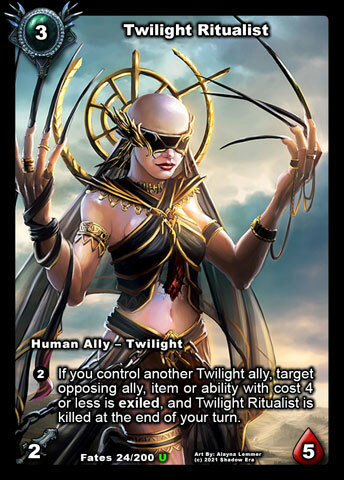 Notes: Ritualist has to be on of my favorite allies in Shattered Fate. 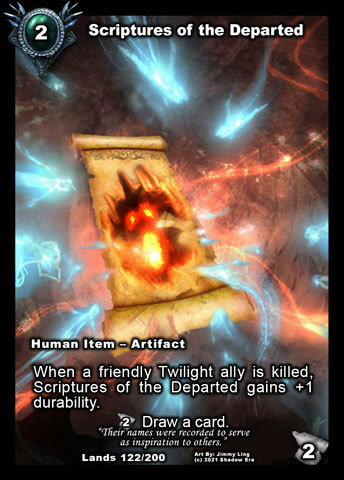 Ritualist is able to target allies for removal which generally has been more useful that removing an ability or item. Ritualist’s ability to remove allies, can be difficult to trigger before turn 5 due to needing another friendly Twilight ally in play as well as resources to pay cost. Typically if I use her ability on an ability or item it is usually later in the game or at a time I feel I can cripple opponents strategy. Lots of decks have multiple copies of key Draw Engines, Artifacts, and Abilities so when you remove one another just takes its place, so their removal is more about timing. The card removed via Ritualist’s ability is actually exiled, which is very important. This disrupts various interactions such as destroyed or killed effects, as well as helps to create graveyard disruption by preventing the targets from going there. While she has great strength she is limited to builds containing Twilights. Notes: Twilight Warden is a fairly flexible ally. Early game she is generally only used going first, or specifically against Hunters to break Snare Trap due to Steadfast. Late game is really where she really shines when she comes in as a larger 5/5 threat for a cost of 3, which makes her more threatening than other Twilight comparing to base stats. At any point in the game she will combo well with haste. Warden can at times be difficult to use due to the various Twilight cards that can protect or recycle allies keeping the graveyard bare. Due to Steadfast she has some small playability (though not realistic) outside of the Alignment though there are other better options. Notes: Twilight Shepherdess has all the right stuff. She has high health, can use her ability and still attack, has an interesting ability and can be used outside of Twilight builds. When I was able to use her effectively, it consisted of playing with Twilight Lance, where I was able to protect Shepherdess with Stealth (Silent Strike) and then drop hasted Kallista to renew resources, spam the board, and then take advantage with Kallista granting additional attacks to another newly summoned ally (or renewed Resources if choosing to target Shepherdess. The high health makes her extremely survivability so I could see he working well in Tala as a protector or to deal the final blow for Victor/Nishaven. Additionally she would be able to take a hit of retaliation damage being used as a setup for killing an ally. Additionally she can be pair with self removal tools (Retreat, Road Less Travelled, Final Flourish and Vozition Orders, etc) to remove Shepherdess prior to end of the turn negating her ability to enforce death on the selected target chosen for renewed resources. What is also interesting is the gaining of the Twilight Alignment tag which can grant all Twilight bonuses to non-Twilight allies at least while they are in play. 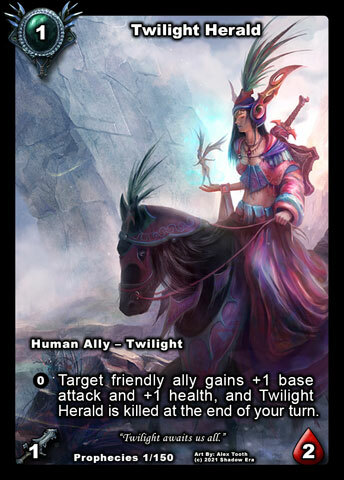 Notes: Twilight Orphic is a pretty good ally for the tribe. 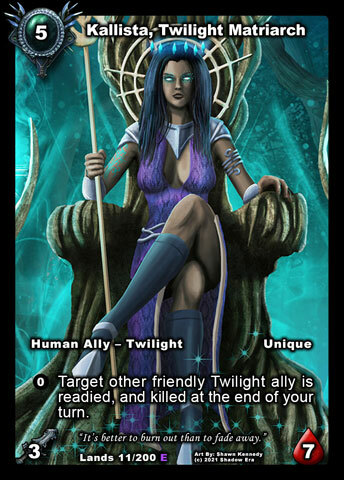 She has both a summon and enters play effect increasing the survivability of other Twilights. This effect can occur from re-entering the board from cards like Twilight Eidolon as well as Twilight Avatar. When re-entering the board due to Avatar, it is important to remember what order she comes in (1st or 2nd). If 1st, then 2nd revived Twilight would not gain the +1 hp. The on death effect is really interesting as well. Mass HP reduction works favorably especially if you can keep looping her to keep her on the board. With 3 attack power she also can’t be ignored. Notes: Twilight Champion is the Fatty of the Tribe. Generally he will become target number one, because if opponent decide to take out other Twilight first he will begin growing into a larger threat. Her growth and survivability can be increased with Lifebringer and Headdress, where Headdress can also be used to grow a different target creating two threats vs one really big one. Growth from Twilight death only restricts her from any use outside of the Twilight Alignment. Notes: Personally i have not had much luck using luminary, but I have been monitoring jklop1 running a Twilight Boris who is using her with some success. Luminary has some nice survival skills which can keep her alive long enough to start using her Seek ability. Primarily you’d want to seek for Kallista, then followed with Twilight Opportunist and Demetreyo. Both can hit hard twice when activated with Kallista’s readied ability, then become bait for Twilight Headress growing either Luminary, Kallista or some other target. Twilight Herald can also be used with Luminary/Kallista combo as well. Seek for 2SE is pretty good cost but you end up limiting your Hero ability, however there are other ways to control the board effectively if you choose to go this route. Notes: Kallista is quite possibly one of my favorite allies, however her use is restricted into the Twilight alignment only due to her ability, as her base stats are the same as many 5cc Human allies. Within her alignment she is an excellent ally. She has the ability to grant super haste to allies entering the board, or she can grant a second ally use to those already exhausted on this turn. This can be extremely powerful combo with the right combinations of cards thus creating a need for opponent to target Kallista for removal. This means that you probably want to play with cards that are able to assist in keeping her alive so that you can use her ability. Protector and Stealth as well as health boosts tend to work fairly well. 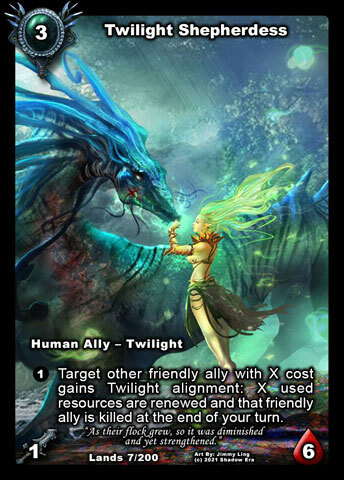 Notes: Avatar is such a cool ally, and bring Shadow Era’s version of tokens into the game. As a vanilla ally his stats are ok but not enough to really be splashed outside the alignment (his attack equals the highest but losing out on ability). In a Twilight build however he pulls two 1/1 allies back to the board along with there card abilities. 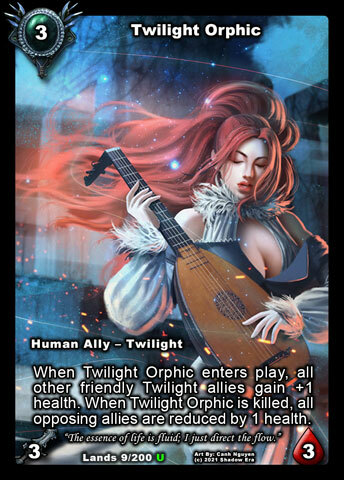 This is particularly interesting when pair with cards like Lifebringer and Orphic that give some immediate impact, and some additional synergies with Warden, Champion and Luminary depending on the build, and of course a chance to use the abilities of the other Twilights again pending their survival to the next turn. 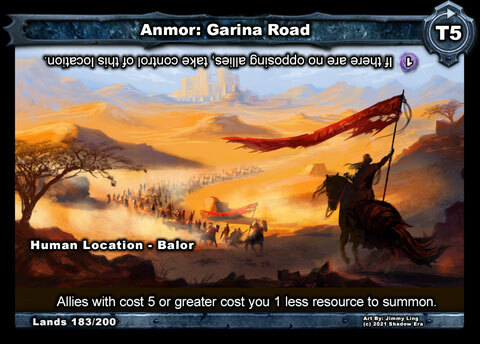 These card are made better by creating options for various outlets such as Twilight Location, Road Less Traveled, etc. Notes: This is one of my favorite attachments in the game. First it is super cheap and easy to combo onto allies and generally does not require the assistance of tempo to summon. +2 attack boost (to Twilight) is huge for such a cheap cost, pairing especially well with Haste/Readied or Growing allies to get extra big damage. Notes: I like to use Alignment cards so this is an excellent draw source for me. This is one of the more easier conditions to draw on for this tribe compared to Eidolon and Scriptures of the Departed. Spirit of Devotion only requires attaching to a Twilight Ally and dying which is pretty much a guarantee during the match. The super low cost means you can generally drop it same turn with an ally. Drawing 2 cards is pretty huge for cost of 1cc too. Notes: Twilight Eidolon is a no brainer as far as inclusion in every Twilight build. 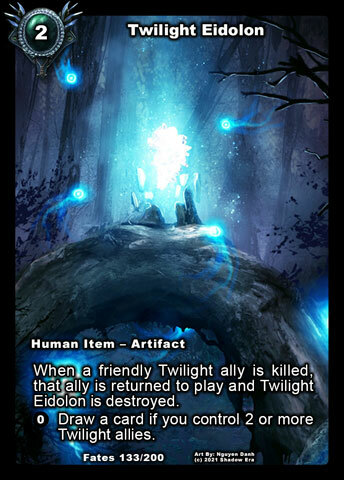 Twilight Eidolon is a great artifact for the Twilight Alignment. This gives a dual life to the first Twilight ally killed on the turn. This both helps to save allies on the board, but can also save damage off of your Hero. There is also the possibility of using this as a secondary draw engine as well, though generally you will not be drawing a significant amount of cards on it. NOTE: If Eidolon triggers on your turn, Twilight ally will be readied at the end of this turn, if Eidolon triggers on opponents turn then Twilight ally will not ready until end of your next turn. Notes: Scriptures of the Departed is like a real draw engine for the Twilights. That being said I think it is my least favorite option. The pros are that you can get potentially unlimited draw from a very small cost, but you need to consistently have a flow of Twilight allies willing to die. This is typically going to work better in a late game where you can potentially swarm a board or play allies and/or recycle effects to max draw potential. The bad is that once you use the last 2 durability its gone so you need to focus on maintaining durability in the 3-4 range prior to drawing. Additionally once you get above you durability count and consistently stay above that number you are wasting durability. It would be interesting to have an excess durability outlet (like Barrenland Gremlin) but currently one does not exist that would work favorably with Twilights. 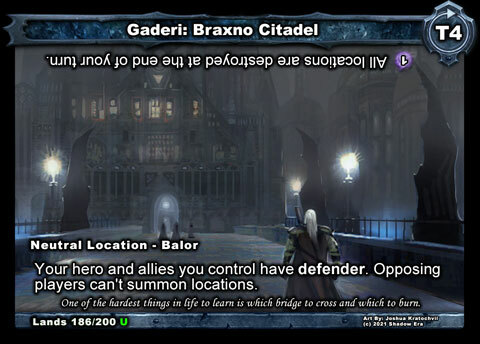 Scriptures is usually paired with cards like Eidolon (for ally survivability which also can cause a potential double trigger for durability) and Avatar (putting two Twilight graveyard allies onto the board). Notes: Ritualist Headdress is one of the corner pieces of the Twilight Tribe. 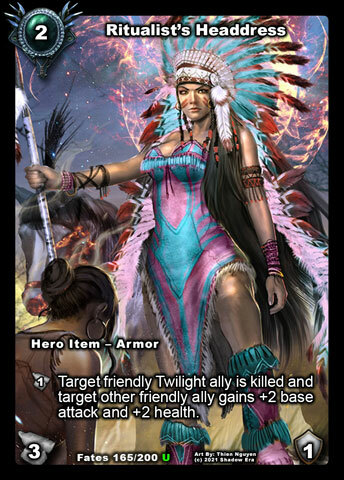 With lots of Twilight allies have a delayed death sentence, you can turn those allies into a benefit and Headdress does it by growing another ally. 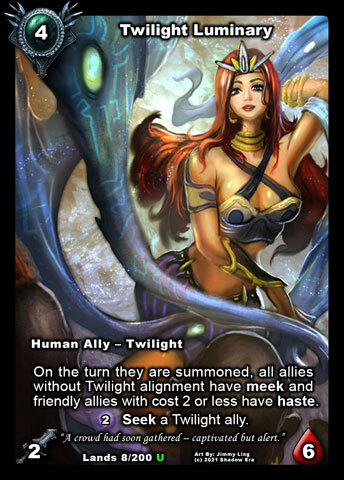 The ally you choose to kill must be Twilight, however the ally you choose to boost does not need to be Twilight. In addition to the excellent growth boost of Headdress, it also helps to act as Negative Attachment replacement (kill the ally for growth instead of removing attachment). 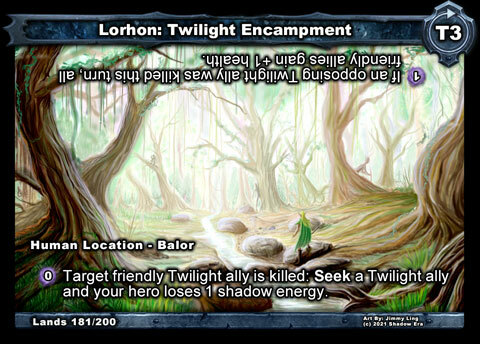 Notes: This location is cool as it gives what the Twilight wants the most…more allies to use. Essentially you give up one in exchange for another which you will also have to summon, with the SE cost coming at the end of turn that you don’t have to pay if you have none (use on same turn as Hero ability). 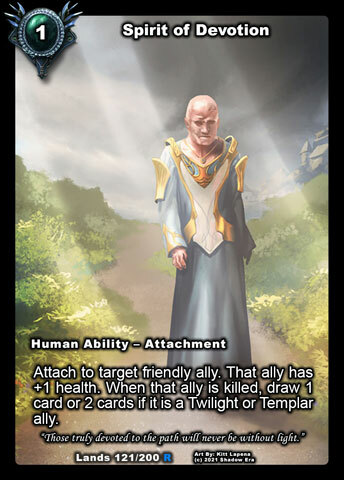 The chosen “cost” ally dies immediately so you would most likely be playing with cards such as Spirit of Devotion, Twilight Eidolon and/or Scriptures, as well as allies like Shepherdess, Champion, Warden and Avatar who can all get some benefits from their death. Twilight Headdress has a conflict of interest with this location as both kill the ally immediately. 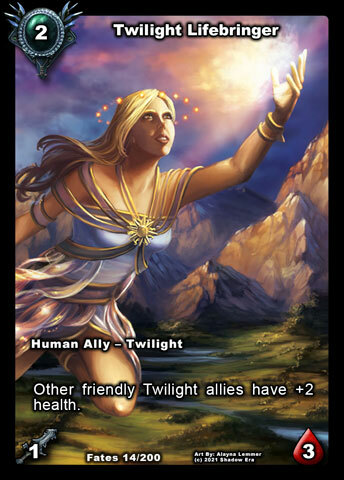 Notes: Twilight have some really great higher cost allies, Twilight Champion, Kallista and Avatar that could be great allies to Seek. While the Twilight Location offers a broader Seek range of Twilight allies, it is a different cost and Garina Road has an additional Controller ability (passive) to help reduce cost of your Fatty allies as well as a different Non-Controller ability. Playing Kallista or Avatar 1 turn earlier can allow you to combo play a bit easier, help you skip a resource sacking amongst other benefits. 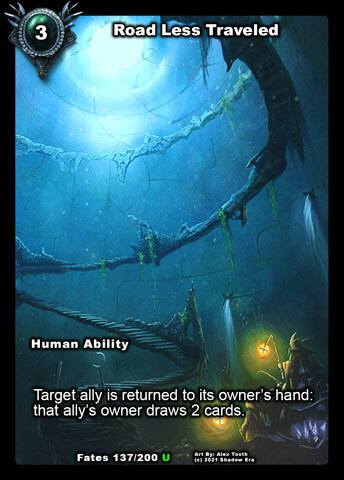 Also with the potential looping of Twilight allies (Eidolon) it can be harder for opponent to steal control of this location. Notes: Defender is an excellent way to protect your Twilight allies from dying. 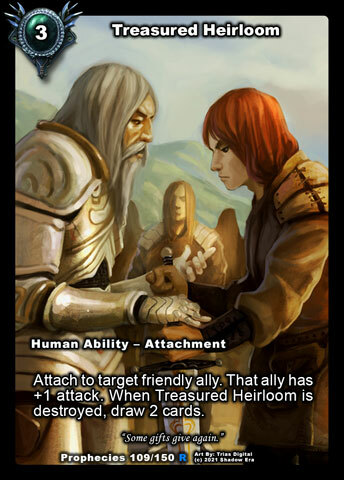 This is going to pair favorably with higher attack value allies so increasing attack helps too. Orphic stands out a ally that works in this type of build as she can lower the health of all of the opposing allies bring them closer to kill range and increasing your allies survivability. Making your allies also harder to kill could deter opponent from wanting to attack into your allies. 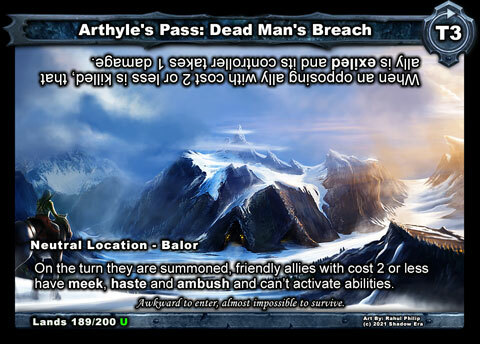 Notes: Arthyle’s Pass behaves in a very similar manner to Twilight Luminary, however Pass is a bit easier to combo with and is slightly different. With Pass, you loose the ability Seek for 2SE but gain Ambush and Meek. This also adds location tech to your deck and a potential overlapping theme with Luminary. 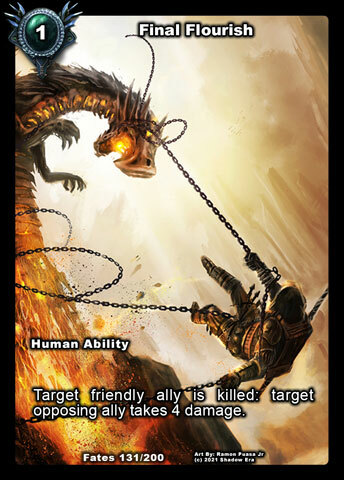 Ambush (Survivability) is nice for the lower cost Twilight allies as they have a general lower attack value as well possibly not able to get a killing shot in. This is important as you can now deal some ping damage to allies (Meek) prior to possibly using them as kill bait for other death benefits, such as Ritualist Headdress or other outlets. Tagged alignment, guide, lost lands, Shadow era, shattered fates, tribe, Twilight.